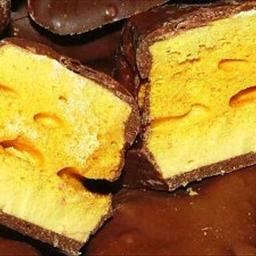 This Honeycomb Toffee recipe is mouth-watering, melt in your mouth, delicious. You can either have the Toffee plain, or if you like, you can dip it in some melted chocolate and leave it to set...just like Violet Crumble. Put cold water, sugar, cream of tartar and syrup in a strong pan and heat gently, stirring occasionally with thermometer until sugar has dissolved. Boil without stirring until the mixture reaches 310°F. Remove pan from heat, mix the bicarbonate of soda in the warm water and add to boiling toffee. Stir gently, and pour at once into greased tin. When set, remove from tin and tap with a weight or toffee hammer to divide.